It was good. I thought we had a great start to the game. I thought the guys were ready right from the start. After that, it was just a hard battle throughout. They have a good team, so it was a game we needed everybody, and everybody played hard. I think it does. Whenever you come back, it’s always a good feeling. Especially against that team, because you said that – there’s a rivalry there. And they’re good. Like, they’re a hard team to come back against, so whenever you do that, it’s exciting. I think we had a lot of energy. Right from the start I think the guys had a lot of energy. I thought we played smart. I thought we got the puck deep so we could get our forecheck established. Whenever we get our forecheck, I think we play better. So, right from the start, we established that, we got on ‘em, we turned some pucks over and we took some pucks to the net. I think the guys were real focused. I thought they were focused, and I think they wanted this game and they played hard to get it. A little bit, I guess. Whenever you bring a guy up, you don’t know how he’s going to play. I was told good things about him when he was in the minors. I was told he could defend and he’s a good skater, he defended well, and that’s what we saw. He’s come up, he’s good on defending and he can skate well. Right now, he was able to step in and he’s played well for us. Winning is a lot more fun than losing. We’ve done a losing this year, so I think we’ve got nine games after this? These should be fun games for guys to play in. We’ve have guys that have got an opportunity to play at this level and most of the teams we’re playing are not in this position that we’re in, but they need points. They’re getting ready to go into the playoffs, so I think it’s a good challenge for these young– not only young guys — but our whole team to compete against teams where the intensity level is high, so it forces us to play well. Like I said at the start, winning is more fun and the way we did it tonight was good. Yeah, I thought we played well, but I don’t think we can go too far with this win. They were missing three of their best players in the lineup. They had a lead for halfway through the third and they’re missing their probably, arguably, their top three players or at least top players regardless. So, it was a good game for us and, like I said, it would be good for us to win some down the stretch here. No, I fall down a lot either way. I saw Will Ferrell, but I didn’t see Ron Burgundy though. So, no, Burgundy wasn’t here. He’s been playing well for us ever since he’s come up. He’s had some good looks. I knew that, just my position, I knew it had a really good chance of going in. It was kind of a knuckleball, which is probably difficult for the goalie to pick up on and it’s good to see guys like that get their first ones. And like I said, him and Walks have come up and played really well for us. Well, at first, I was just wondering if it hit Brownie in front. But by the way he reacted, I guess it didn’t touch him. I was just excited. It felt awesome. We were pushing all night and it just felt good to kind of get some energy and go from there. I think Brownie or Marty grabbed the puck and everyone was super happy for me, so it was awesome. You like to get one and you like to contribute and produce, but my style of game, I’m more concerned about defense, so I wanted to keep shooting and hopefully one was going to go in. Definitely. You could feel the excitement in the building tonight, so it was a lot of fun. I don’t know. I think we played well, so I think we’ll try to build off it as best we can. No, not yet. I don’t even know if my family saw it. It’s a little late, Eastern Time for them, but maybe tomorrow morning I’ll text them. I think everyone kind of think about it. You kind of want it, but I wasn’t trying to force it or anything. I’m just glad it came tonight. Yeah, for sure, especially at home. It was awesome. –With the win, Los Angeles improved to 67-67-20 all-time against San Jose, a record that includes a home mark of 40-29-8. 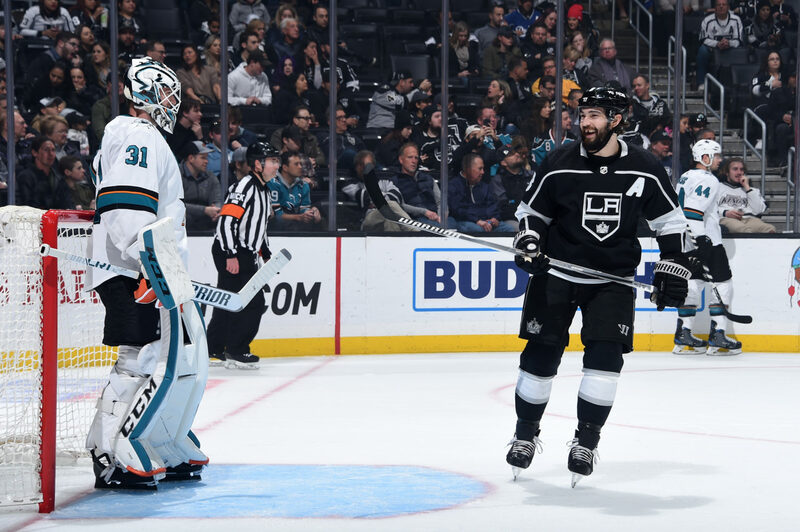 The Kings and Sharks both finished their 2018-19 season series with 2-1-1 records and an even goal differential of 10-10. Los Angeles finished the season with a points percentage above .500 in the series for the first time since 2014-15 (3-2-0). Including playoffs, Thursday’s win was only the second win in the last 12 L.A. home games in the series. –With the win, the Kings improved to 17-20-4 against the Western Conference, 10-9-2 against the Pacific Division, 4-13 in two-goal games, 19-4-2 when scoring first, 12-15-4 when tied after the first period, 2-33-2 when trailing after the second period and 10-15-2 when outshooting their opponent. –The win was Los Angeles’ first regulation victory when trailing entering the third period. The only other game this season in which they won when trailing after two periods was the 4-3 overtime win at the New York Rangers on February 4. –The win was the 1,699th regular season victory in franchise history. –By limiting San Jose to two goals, the Kings held their opponents under three goals for the third time in the last 19 games. –With his game-winning goal, Anze Kopitar (48 GWG) surpassed Dave Taylor (47 GWG) for third place on the club’s all-time game-winning goals list. –Dustin Brown (1,108 GP), who moved within three games of Dave Taylor’s franchise record for games played (1,111 GP), registered his 331st career assist on Kopitar’s goal, moving him within two assists from Rob Blake (333 assists) for ninth place on the franchise’s all-time assists list. With his first period goal, he reached the 20-goal barrier for the seventh time in his 15-season NHL career. –Matt Roy scored his first career NHL goal and now has three points (1-2=3) in the last four games. He totaled two shots, two hits, three blocked shots and a plus-two rating in 17:49 of ice time, 1:30 of which was spent during the team’s two-for-two penalty killing performance. He has played in 16 straight games since making his NHL debut February 9 in Boston. –With his empty-net goal, Jeff Carter scored his first goal since January 15 at Minnesota, ending a stretch of 20 games he played in without scoring. –Alex Iafallo (0-2=2) registered his fourth multi-point game and first multi-assist game of the season. He tied his career-high for assists in a game (third time; last: November 7, 2017 at Anaheim). –Los Angeles attempted 48 shots (35 on goal, 4 blocked, 9 missed). San Jose attempted 60 shots (25 on goal, 18 blocked, 17 missed). Dustin Brown led all skaters with a game-high seven shots. He did not miss the net or have a shot blocked. –The Kings won 36-of-56 faceoffs (64%). Adrian Kempe won 9-of-10, Anze Kopitar won 18-of-26, Dustin Brown won 0-of-1 and Jeff Carter won 9-of-19. Brendan Leipsic suffered a lower-body injury during the LA Kings’ 4-2 win over San Jose Thursday night and didn’t return to the game after the conclusion of his final shift with 3:29 remaining in the second period. Leipsic, a 24-year-old eligible to become a restricted free agent, has seven goals and 23 points in 61 games. He appeared in 9:21 of Thursday’s win, totaling one shot on goal, two hits and one blocked shot. It was not immediately clear what caused his injury. Leipsic had previously missed only one game with Los Angeles since being claimed off waivers on December 3, a 3-2 win at Anaheim in which his absence was due to a coach’s decision. Los Angeles concludes a five-game home stand Saturday night against Anaheim. Desjardins opted for a balance of 11 forwards and seven defensemen on Thursday, with forwards Ilya Kovalchuk and Jonny Brodzinski serving as healthy scratches. The Kings are scheduled to practice at 11:00 a.m. at Toyota Sports Center on Friday, March 22.